Demi Lovato has vowed to keep fighting after a suspected drug overdose sent her back to the hospital. 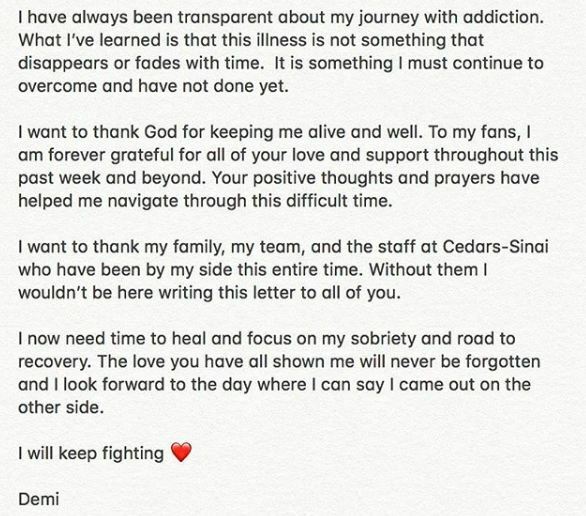 Demi Lovato took to social media on Sunday after being treated at a Los Angeles area hospital for a suspected drug overdose which has her fans and well-wishers worrying. I have always been transparent about my journey with addiction. What I’ve learned is that this illness is not something that disappears or fades with time. It is something I must continue to overcome and have not done yet. I now need time to heal and focus on my sobriety and road to recovery. The love you have all shown me will never be forgotten and I look forward to the day where I can say I came out the other side. I will keep fighting. The fans of the singers are worried for her health but Demi has promised that she will fight on. We wish her the very best in life. The singer has successfully transitioned from a Disney girl to a mature women artist and is seen as a global icon. She is famous in India as well.